The second of the two 21st-century transits of Venus will not be visible in its entirety from the British Isles. The latter stages of the transit will be in progress during sunrise. This transit favours observers in eastern parts of Asia and Australasia, and parts of north western America. Sadly, people living in the southern part of South America miss out on both of the 21st-century transits of Venus. Venus will cross the disc of the Sun on 2012 June 5th-6th. The map above shows the visibility of the event. The entire transit will be seen from north-west Canada, Alaska, eastern and northern Asia, the eastern half of Australia, New Zealand and the islands of the Western Pacific Ocean. The Sun will set while the transit is in progress in the grey area encompassing eastern Canada, the United States, central America and the north-western part of South America. The Sun will rise while the transit is in progress in the grey area taking in south-west Asia, eastern Russia, the Middle East, north-eastern parts of Africa and most of Europe, including the British Isles. The yellow lines on the diagram show the position of the terminator, where the Sun is either rising or setting, at the key phases of the transit. The geocentric circumstances of the transit are shown in the diagram to the right. During the transit, the diameter of the Sun is 1891.4 arcseconds and that of Venus is 57.8 arcseconds. In other words, the diameter of Venus is 0.03 that of the Sun, making it look like a rapidly moving sunspot. The whole transit lasts just under six and three quarter hours. All timings are in Universal Time (UT). To convert to British Summer Time (BST), add one hour to the Universal Time. In the United Kingdom, the transit ends between one and one and a half hours after sunrise depending on your location. 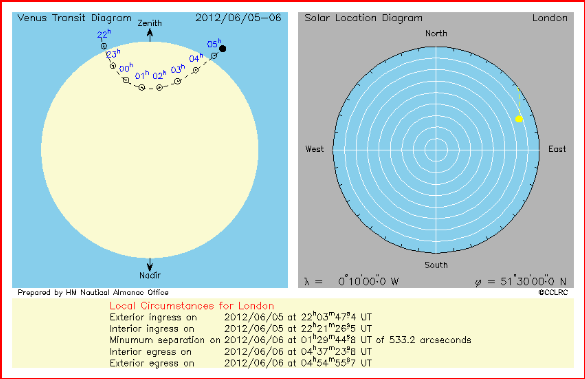 Taking London as an example, sunrise occurs at 03h46m (UT) in the north-eastern sky. The final stages of the transit are in progress at sunrise. Venus starts to cross the solar limb at interior egress at 04h37m (UT), and the transit ends with exterior egress at 04h55m (UT). The progress of the transit is summarized in the diagram below. The left-hand panel shows the movement of the Venus across the solar disc. The top of the diagram points to the zenith, the point directly overhead. The position of Venus is marked every UT hour. The right-hand panel shows the movement of the Sun in the sky. At the beginning of the transit, the Sun is below the horizon. By the end of the transit the Sun is east north east at an altitude of just over 10°. Summary plots like the one shown above and animations showing the motion of Venus relative to the Sun as seen by someone observing the transit through appropriate eye protection are available for several locations across the UK and Ireland. The summary gif files are ~18Kb and the animations are ~200Kb. To view the animations properly, it may be better to download the animations and view them locally. If you wish to generate your own predictions for this transit, the Astronomical Applications Department of the US Naval Observatory has produced an online Transit Computer.